"Most everyone loves the taste of a salty sweet flavor. I have been using brine for years when making my turkey and chicken. I've tried this one or that one, but finally settled on taking the best elements of my 3 favorite ones to create my own with all the wonderful flavors of Thanksgiving." In a large stockpot, mix together the kosher salt, orange juice concentrate, cranberry juice concentrate, water, brown sugar, cinnamon stick, lemon wedges, orange wedges, onion wedges, garlic cloves, bay leaves, thyme, and black pepper; stir until the salt and brown sugar have dissolved. To use, place a whole turkey into the brine, cover, and refrigerate 14 to 16 hours before roasting. Discard used brine. This cranberry chutney has bite and isn’t as sweet as most cranberry sauces. Before roasting, stuff the brined turkey with a smashed garlic clove and 2 lemons, 2 oranges, and 2 red onions, all cut into wedges. For juicier turkey meat, roast breast side down. This was my first try at brining a turkey and I researched it for hours! 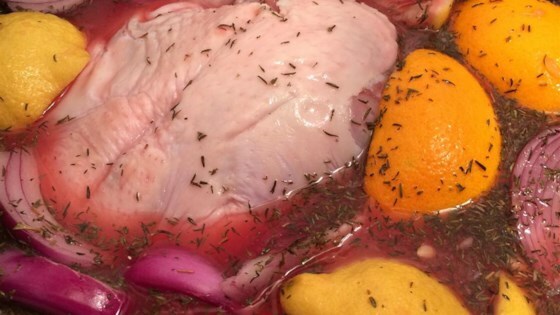 This brine was something a little different and it turned out great. We have a new tradition for turkey! I've never had my turkey get stained...Only thing I have ever had was praise for how good, tasty, and moist it is. I made it for a work potluck and I am being asked for the recepie! It was a hit! It had alot of flavor. I was afraid to try something different, but now I am glad I did. I have used this recipe at least five times and it consistently turns out a moist turkey. I follow the recipe as is. Does to need any tweaking. I use this with Turkey breast and then I smoke them. Great!